Aid Problems Of The Future: Cyberattacks, Economic Collapse And New Epidemics : Goats and Soda Relief organizations can barely cope with today's famine and refugee crises. Are they ready for the next era of humanitarian emergencies? A woman carries bags of food on her back at Dakamur camp, Somalia, in March. 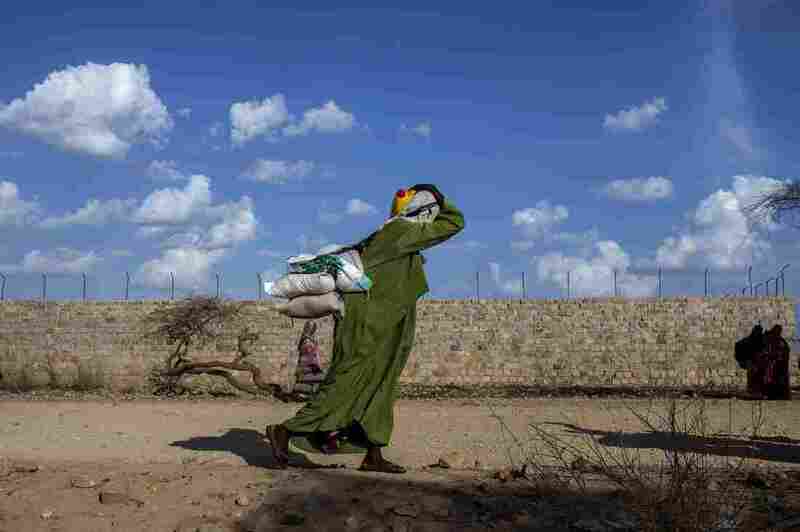 If a famine occurs, aid groups send food. If there's a war, they set up health clinics. But what to do in event of a massive cyberattack? A new disease epidemic? A July report has an alarming message for the aid community: adapt or be left in the dust. "The way in which the humanitarian sector has been operating leaves continued need," says Eilidh Kennedy, an author of the report published by Action Against Hunger. "We're proposing a new way for NGOs to see their role. What do we need to be able to continue operating in the future?" That question led Kennedy and her team of researchers to identify 23 areas of concern. While the report doesn't outline concrete solutions, it highlights issues that the aid groups must address if they want to survive, Kennedy says. They include figuring out how to deal with recurring problems like disease outbreaks, working out issues with staff inequality and anticipating new challenges that come with, say, shifting population demographics. "We think all of them will have an impact on the way the humanitarian system will operate in the next 10 or 15 years," she says. The world's population — and age — is on the way up. According to the report, there will be 8.5 billion people on the planet by 2030. Developing countries will drive population growth. And people over age 65 will be the fastest growing age group. The changing demographics could affect everything from a country's labor force to health system. Climate change and globalization are making it easier for diseases to spread. Old diseases that we thought we conquered, like polio, are reemerging. And Ebola showed the aid community just how unprepared it was to deal with new diseases. For a long time, big humanitarian groups couldn't see the value in adding religion to their work, says Kennedy. But according to the report, local, religious groups are able to help deliver aid faster and more efficiently. They're more likely to gain trust and access from the communities they're serving because they share the same language, religion and culture. In many middle- and high-income countries, we rely on computers and the Internet to operate almost every aspect of our daily lives: our health care system, the electricity grid, public transportation and financial services. A cyberattack that shuts down basic services — like one that infected millions of computers across the globe in May, including the U.K.'s health system — could push governments to seek help from aid groups. Venezuela's economic collapse is further proof that middle- and high-income countries have humanitarian needs, too, says Kennedy. The crisis has resulted in a shortage of food, medicine and household supplies. As a result, thousands of people have scattered across the country in search of jobs and resources. Western aid workers often have higher salaries, decision-making power, seniority and protections than local aid workers. The report's researchers anticipate that expat positions will decline, but inequalities in the humanitarian workforce will persist, leading to tensions in the industry. By 2025, 1.8 billion people will be living in slums or shanties. In areas like these, conditions are squalid — residents have limited access to clean water, electricity and arable land, and without a central sewage system, will live amid pollution and waste. So how do we even begin to address some of these daunting issues? Neil Boothby, a professor at Columbia University's Mailman School of Public Health and a former special adviser on children's issues at USAID, doubts the solutions will come from within the aid community. "This is a big business," he says. "It [will be] difficult for them to move beyond their business model." They'll have to, says Kennedy — because if the report reveals anything, it's this: the humanitarian sector will need "fundamental, not incremental" change.